The Camo Shop has long been known as the place to go for hunting-related camouflage bedding, clothing and accessories. Now, they've announced a new line of military camouflage bedding. The Camo Shop has long been known as the place to go for hunting-related camouflage bedding, clothing and accessories. Now, they've announced a new line of military-patterned camouflage bedding to join their hunting camo. "There's more than one kind of camo out there," said Tony Brobst, president of The Camo Shop. "Hunting camo accessories keep hunters in the woods after they've come home, and military camo brings people closer to the friends and family they have in the military." The Camo Shop has been selling camo bedding in hunting patterns from major brands like Realtree and Mossy Oak for quite some time. Brobst said that they've added the military patterns in order to appeal to a new market. "Military or Army camo is especially popular with children in military families," Brobst said. "Kids can decorate their room to remind them of Dad or Mom when their parents are away serving our country." The Army camo bedding comes in a military camouflage pattern, available in pink, blue, or the classic green. And The Camo Shop has more than just bedding on hand. They also sell curtains and valances in matching patterns, making it possible for any Army lover to completely decorate their bedroom in full military camo. "Camo, military camo especially, has become pretty popular recently," Brobst said. "It's a great decoration and it's a great way to show support for the military, especially if you have friends or family members serving overseas." In business now for 6 years, The Camo Shop is headquartered in Tulsa, OK. In our warehouse we maintain stock on most of the items that we sell for quick order fulfillment and shipping throughout the U.S. and Canada. 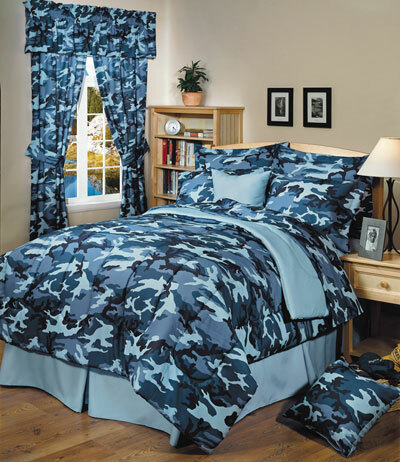 We specialize in hunting camouflage merchandise for home décor (including camo bedding, lamps, rugs, drapes, etc. ), clothing and camo truck accessories that enable the hunting enthusiast to celebrate their passion for the outdoors. Visit us online at http://www.TheCamoShop.com.